Being visually impaired, or even blind, doesn’t mean you have no eyesight at all. In fact, the definition of partially sighted might surprise you – it runs from 3/60 vision to 6/20 with a full field, or 6/24 with a moderate field restriction and 6/18 or more with what’s called a gross field defect. Similarly, if you can’t see someone holding up five fingers from a distance of six metres of less even when you have your eyewear on, you’re essentially partially sighted – as a rough guide, that’s used as a standard. Our eyes are valuable things, but we often take them for granted until we experience eye trouble. You might first notice deteriorating sight on visits to opticians for eye tests and needed stronger prescriptions and new eyewear; if you suspect you’re having eye problems you should have your vision checked once a year. If you suspect your eyes have deteriorated to the point where you might be classed as partially sighted, visit your GP. He can refer you to an ophthalmologist who can perform the necessary tests and register you as partially sighted, if you wish. It’s not mandatory for you to register, but it can bring benefits, such as extra allowances, services you might be able to obtain from social services, free eye tests from opticians and more. However, many opticians won’t be able to supply you with eyewear if you’re partially sighted or blind. 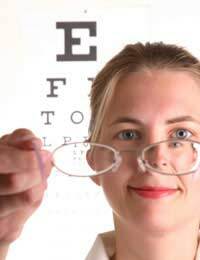 The partially sighted can do most things that people with no eye trouble can do. They might need books with large print and magnifiers in order to read, but read they can. Similarly, at work they might need screen magnifiers for their computer monitors, but they’re still able to work just as well as someone without any eye trouble. As far as eyewear goes, in many instances the frames are not a problem, but the prescriptions tend to be very specialised and complex, and for many partially sighted people, eyewear alone isn’t enough. However, that’s no reason for you to have cool frames. Your choices on eyewear might be somewhat restricted by your lens prescription, but there will still be a good range of eyewear available to you. Unfortunately, being partially sighted doesn’t mean you automatically qualify for government assistance in paying for new eyewear. There are circumstances in which you’ll be issued with a voucher to help pay for the glasses – but tell the optician before the sight test and choosing the eyewear. You can qualify for a voucher if you’re on Income Support or Jobseeker’s Allowance, you’re under 16 (raised to 19 if in full-time education), or a few other reasons. Although they can’t help with eyewear, the Royal National Institute for the Blind can be a very useful resource for the partially sighted, letting you know just what help is available and even offering support, and, in rare instances a grant of money (it’s not a lot - £500 per person over three years, but it can make a difference). This extract from your text is not clear and the grammar is poor- and the letters in the validation box are mixed up. Similarly, if you can’t see someone holding up five fingers from a distance of six metres of less even when you have your eyewear on, you’re essentially partially sighted – as a rough guide, that’s used as a standard.